Serves 4. Preparation time 5 minutes. Cooking time 5 minutes. 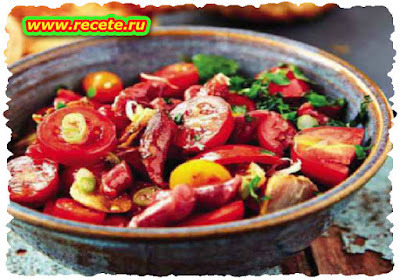 • Chop the tomatoes into quarters and thinly slice the spring onions (white parts only). Place them in a bowl with the sugar and parsley. • In a hot pan, fry the salami in a bit of oil until crisp and remove. Slice the garlic into thin slivers and fry in the same pan until slightly toasted. • Pour in the sherry vinegar and add the paprika. Shake the pan before add ing this to the tomatoes. • Drizzle the olive oil and crumble the crisp salami pieces over the salad. • Serve immediately with any braaied meat. This salad is especially good with chicken.